Near the Christmas holidays a friend shared a few tulip bulbs with me. I placed them in the vegetable drawer of the refrigerator to chill until I could get them planted. I should never have delayed because then it turned very cold and wet and well, I did not get them in the ground or even in a pot. After seeing Christina’s lovely forced tulips this week I remembered I should do something with these bulbs. 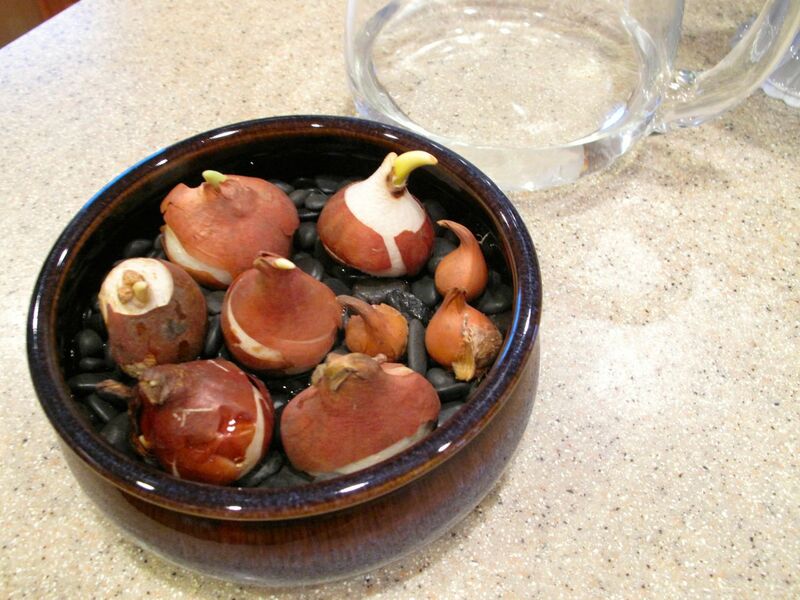 After a quick search I came across a method for forcing tulip bulbs in water and decided to try it. The first step is to drop a few handfuls of stones in the bottom of a container. Next set the tulips on top with the pointed tip facing upwards. Fill the bottom of the dish just up to the base of the bulbs, being careful not to allow the tulips to sit in the water. Finish by adding a few more stones between the tulips. I set the container of tulip bulbs in a cool dark room where I will leave them for several more weeks. The water level will need to be maintained evenly and the water should be changed weekly. Have you ever heard of this technique? Is it wishful thinking? The 6 larger bulbs are Endless Spring. The 3 smaller ones are Persian Pearl Tulips. This entry was posted in garden and tagged Endless Spring Orange Blend Tulips, Forcing bulbs, Persian Pearl Tulips on February 28, 2015 by pbmgarden. I don’t see why it shouldn’t work, there are vases for Hyacinths where the bulb sits just above the water, so it should work with your tulips. I hope you are successful! Thanks Pauline. I have one of those hyacinth vases somewhere. Will have to hunt around for it. Please give us an after-action report on success or not success. Whatever happens it would not be a ‘failure.’ We learn something in the process. Will do John. I thought about holding off and posting when the bulbs bloom, but knowing how unreliable I am tending to details like this, I decided to go ahead. Hope it will work though. You may have to add some gravel on top since tulips aren’t quite as vigorous rooters as some of the other bulbs, and may uproot and fall over. Thank you for the tip about adding gravel. I see now how that could be a problem. Susie, this looks interesting and possible as there are so many crops grown hydroponically now. Will you need to make some kind of frame to stop them leaning out with the weight of the stems and heads. Looking forward to the results Susie, good luck. I don’t think I thought this through carefully enough Julie. I’ll have to come up with an idea for support. When I came across this idea somewhere on the internet, the bulbs were placed inside a deep glass vase that was slightly wider at the bottom. Its sides would provide support naturally. Maybe when I change the water I’ll switch to a better container. Thanks. You could easily create a tubular circular frame with 5 upright sticks and a couple laid across horizontally and tied with twine, to place over the top, you are so creative Susie, I am sure you would make one that looked lovely too. Good suggestion (and thanks for the vote of confidence Julie). I look forward to seeing how this turns out, it’s always good to experiment! Oh, I hope I can keep the tulips going. It sounds viable and it will be great to follow the progress with you Susie. We might all be forcing tulips next year if it works! Good luck! I’ll keep you posted Cathy. I don’t usually plant tulips outdoors because of the deer, so this would be nice if I can keep them going. I’m interested to see how this pans out – I’ve heard of this method for hyacinths, but I’ve never seen it done for tulips – I hope it’s successful! Matt, I will do an update later and hope I can show you some flowers. Looking forward to seeing these in bloom. I’ve been tempted by ‘Persian Pearl’, a very striking species tulip. Well, this will be interesting. I’m not the most reliable indoor gardener but hope to be able to share the Persian Pearls. It looks like it might work…crossing my fingers….I would love to force these too. 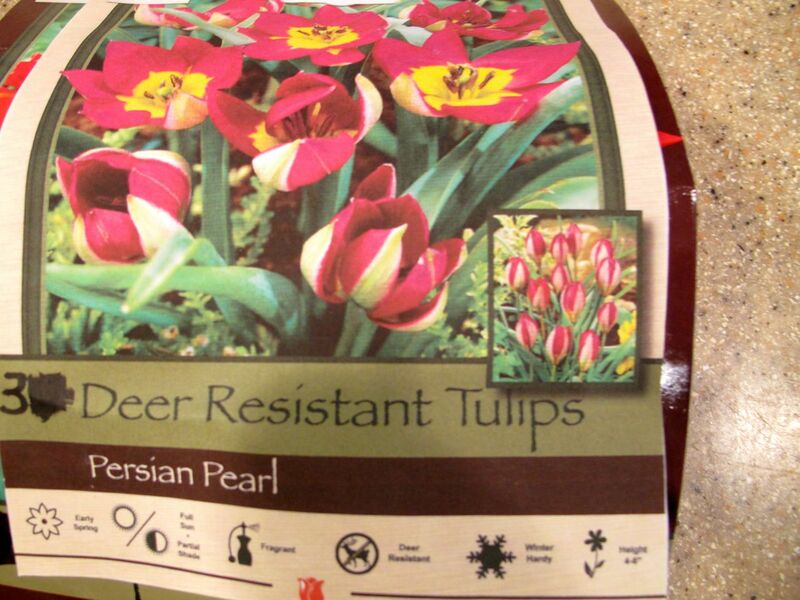 BTW, those deer resistant tulips are not. My deer love them, and if they don’t eat them, then the voles or squirrels get to them. Forcing some indoors might be best. Good to know about the deer resistant label not being accurate. I’m hesitant to plant anything deer are known to love so I don’t usually do tulips, although some down-the-streetn neighbors have quite a nice display every year. “Deer Resistant” is indeed usually wishful thinking! I plant a very small bed of tulips each year withing the confines of the fenced-in vegetable garden. I would think your forcing method will work. 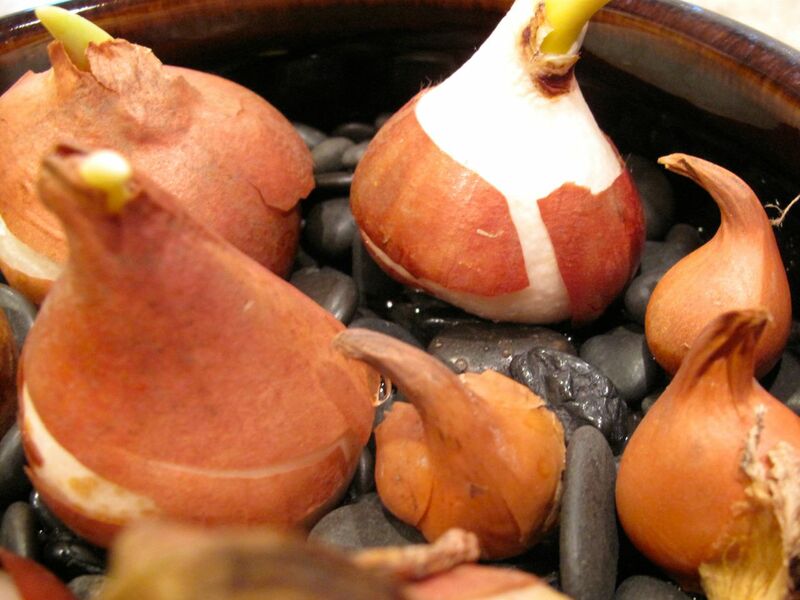 Just make sure that only the very base of the bulbs is in water so they won’t start to rot on you. Some sort of support might be a good idea, as others have mentioned. 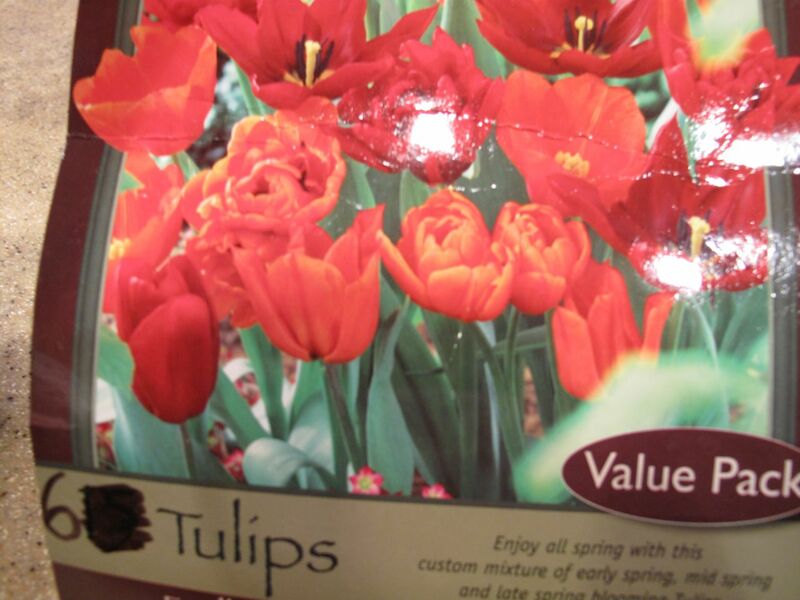 I have never heard of forcing tulips like this. I am intrigued to see whether it will work. Do keep us posted. It does seem an uncommon thing to try but since I didn’t get them in the ground anything I try is just an experiment at this point. It would be nice if the tulips bloom but I’ll report back either way. Even though they are suppose to be ‘deer resistant’ tulips, I would recommend you cage them if you put them in the garden. Hungry deer will eat them and squirrels will dig them up. I’ve seen the florists near my office use decanters as starters. The neck has to be small enough so the bulb just sits in the neck without dropping through. They fill it with water to within half an inch from the bulb in the neck opening. The roots then grow and reach down to the water. I’ll probably discard the tulips after they bloom (or have their allotted time for blooming) because I did notice deer have been in the garden at least once this winter. No need to encourage them. The technique you describe for forcing bulbs makes me think I should lower the water level to be sure the bulbs don’t rot. I think…not sure, but I think…I saw that you could take the tulips out of the water after they have rooted and then put in dirt, in a container. That way you might get the support you need as they get taller! I may have read it on Hometalk? I know I have taken potted tulips, from Harris Teeter, out of the plastic pot and put them either in a nice pot or in water with stones (that hides the residual dirt somewhat!) We are all eagerly waiting to see what happens here! Good suggestions. Thanks Libby! It’s a fun little experiment. More ice/sleet–but wasn’t it beautiful yesterday?